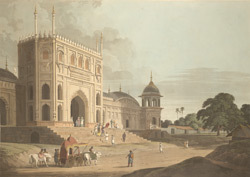 This mosque at Pilibhit was founded by Hafiz Rahmat Khan, the Afghan Rohilla leader whose jagirs or estates included Pilibhit and Bareilly, where he is buried. He became the leader of the Rohilla Afghans in western Avadh, but was killed in a battle against the Nawab of Avadh, assisted by trhe English, in 1774. The gateway is built in late Mughal style, paying homage to the gateways of the Jami' Masjid in Delhi, while the wall around the mosque enclosure shows the curvilinear Bengali roof found in Shah Jahan's additions to the Mughal palace at Agra.